new improvements to facilitate your tier II Process. ERA is very excited to announce new improvements to facilitate your Tier II processing. Below, you will find a registration link for one of our informative Tier II training sessions, as well as a short summary of the changes that are both completed and in progress. Step 2: Based on your selection in the first step, the Processing options will be filtered to show you options applicable to your processing method. 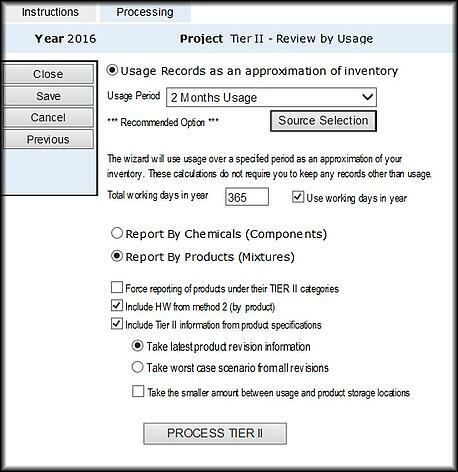 New for RY2016, EPA now supports and XML upload for Tier II Submit. ERA has developed the XML output per EPA specifications, and for this year you have an option to upload either with the old MER format or the new XML format. As per feedback from several customers, ERA has now added a new option to view “Details by Product” so you can QA/QC your chemical data and find out exactly what contributes to your reportable chemical calculations. This functionality is similar to TRI, but will show details related to the maximum on-site calculations based on your Usage or Inventory records, and the processing options you select. Look for this new functionality to be available on February 16th. For more information on how ERA can help your organization achieve regulatory compliance and move towards perfect reporting, please visit our website, or email info@era-ehs.com.